Saturday brought a lot of steady drizzle to Snitterfield and by Sunday morning the airfield had a good soaking. A north-easterly wind required flying from the far end so duty instructors Baz and Steve P disappeared off to the west in the cable retrieve car. Coming back some 25 minutes later, Steve had a liberal coating of mud up his back and it transpired they’d had to abandon the car and walk to even reach the far end of the field. There was no way we were going to be able to operate the airfield. Still there were tasks to be done. The main one being getting the club’s SZD Junior into to the workshop so the wheel-brake could be examined. Naturally it was at the back of the hangar so we assembled a team to unpack five aircraft and repack four. The Junior was derigged into the workshop. A bit before midday, we had word from one of our members that Bidford, the next gliding club down the road had enough dry areas that they were going to be operating. Undeterred from flying by our own waterlogged field, a plan was quickly formed. Some of our members had never experienced aerotow launching so we would organise an on-the-spot mini club expedition down the road to get some flying done. Several cars set off for the 30 minute drive over to Bidford. As our 10 pilot mini-expedition arrived, the tug and two K13s were on their way to the 06 launchpoint. Two of our junior glider pilots, Jenna and Alistair had no hands-on experience of aerotow launching so they were sat down with one of Bidford’s instructors who gave them the long-brief on aerotow flying. When you’ve exclusively learned to fly gliders on winch launches, aerotowing provides new challenges, not least flying level in close proximity to the ground at the start of the tow. Stratford pilot Chris is also a tug pilot at Bidford and he towed both Jenna and Alistair’s flights to 2,000′ with the Bellanca Scout tug plane. Flying from Bidford also gave them the opportunity to practice planning a circuit into a field other than their home airfield and flying around Bidford airfield which can be difficult to spot from the air when you are unfamiliar with it’s layout. Stratford junior pilot Ben who has experience of launching on aerotow and is understood to be close to flying aerotows solo also took a training launch. Later on, Stratford’s CFI Steve B flew with Stratford’s membership secretary Dan for what was the longest flight of the day at 20 minutes. 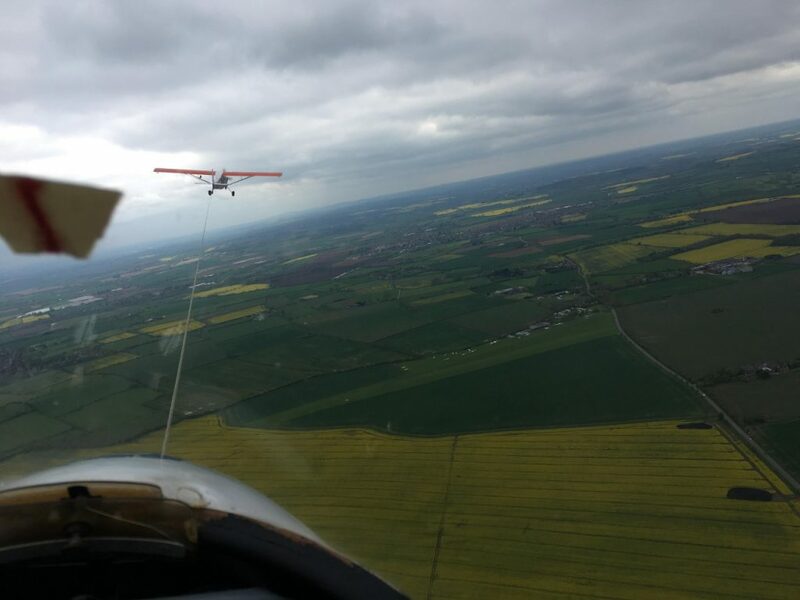 While sailplane launches at Snittefield are all on the winch, Stratford pilots often need to aerotow during expeditions and competitions so frequent practice can be necessary. Thanks to the members and instructors of Bidford Gliding & Flying Club for being so accommodating of our members and letting our mini-expedition get some flying done! This entry was posted in Flying reports and tagged flight training, flying report, junior gliding by admin. Bookmark the permalink.